Hjem Hjemmelading Hylsepreparering Hylsefett REDDING IMPERIAL DRY NECK LUBE- 1 OZ. 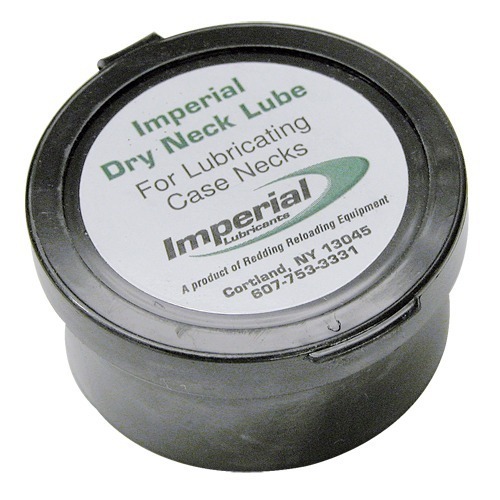 This graphite based powdered neck lube will reduce the chatter and drag on your cases in the sizing die. The dry powdered lube will not contaminate loading powder so there is no need to remove it from the inside of the case neck after sizing. Comes in 1 oz. Denne grafitt basert pulverisert halsen glidemiddel vil redusere skravling og dra på sak i størrelse dø. Tørr pulverisert lube vil ikke forurense lasting pulver så det er ikke nødvendig å fjerne den fra innsiden av saken halsen etter størrelse. Kommer i 1 oz. Kundevurderinger for Imperial Dry Neck Lube- 1 oz. I started using this product a few months ago because I was tired of the mess associated with the aersol spray lubes. I use this lube on the inside of my case necks only. Simply dip the case neck into the media and you're done. Note: This is a two step process becuase I use Hornady's Unique Case Lube on the outer surface of my cases. I found this after struggling with other lubes. I reload .204 Ruger and found on occasion my funnel would block due to excessive liquid-based lube still inside the case necks. This product removes that event all together!! No more brushing out lube required. I could tumble the cases again after neck sizing I guess. Simply dip the case into the powder upto the shoulder, and shake out the excess - that's it!! No brushes, or lube pad required. The dry graphite powder does not clog up the case and die (but does coat the ball a little bit), and I find I only need to lube every 2nd or 3rd case. I use standard Redding neck sizing dies. I do remove storage oil from the neck sizing die stem etc before I begin, so as not to get a big blob of graphite goo on the stem and expander ball. Any graphite powder remaining on the inside of the neck does not interfer with powder loads going into the case, and may also persist, making bullet seating easier than it already is? Combined with the Imperial sizing wax, I have never used my messy lube pad and liquid-based lubes since. The pad would soak up a lot of lube and I found it to be very wasteful. A light coating of graphite powder inside the neck is all that is needed. This small pot will last me decades. Bought to try on new pistol brass going into Dillon 550 so it would not stick on expander. All this mess does is stick to outside of case and get on your fingers. Worthless. Get yourself some Hornady Case Lube instead. This is designed as a neck lubricant. You will not like it on case bodies. Best applied with Imperial spherical ceramic media. The application media comes with some neck lubricant included but this will recharge the media when needed. Produsentnr. : 7700 611760077005 Denne grafitt basert pulverisert halsen glidemiddel vil redusere skravling og dra på sak i størrelse dø. Tørr pulverisert lube vil ikke forurense lasting pulver så det er ikke nødvendig å fjerne den fra innsiden av saken halsen etter størrelse. Kommer i 1 oz.